It’s revision time again. There’s first draft time, then there’s revision time. Revision time is harder. When I’m writing a first draft there’s always the possibility of getting into flow. You know, that magical state where the words stream forth and everything makes sense. The characters speak, the plot advances, the tension is high, and you just know it’s awesome! The day I write “the end” at the bottom of the page, I do a little happy dance. It’s that good. But then it’s time for phase two. No matter how good writing felt, how often I was in flow, there will be things to fix. Some of those things will be major. Most of them will be small–word choice, punctuation, clarity issues. This is the stuff I don’t like to fix because it necessitates hours at the keyboard, searching out the right sentence, tweaking it, and saving it. It’s tedious for sure. I’d rather fix the big things, because then I get to dip back into the writing process, get into flow if I’m lucky, and at the end of the day know that I accomplished something real. Don’t get me wrong, I’m all for ideal word choice and properly used commas, but entering those changes in a manuscript is like balancing your checkbook–yawn. Sometimes, however, I get to something major, like the climax…. That manuscript, the one I’ve lavished with attention for months, the one that thrilled me, the one with flow…well…the climax is lame. I don’t mean bad. I just mean lame. When you have to ask, “where’s the dramatic tension?” there’s a problem. When you find yourself wondering why the scene ended here and not there, there’s a problem. Sometimes we don’t know what we’ve accomplished until someone points it out to us. So much of subtext occurs on a subconscious level. When that happens, I feel brilliant. But sometimes we don’t know where we’ve failed until someone points it out to us. And if your book is already on the market…oops. That’s why it’s critical to rest a manuscript. If you rest it long enough and come at it with (relatively) objective eyes, you’ll see the failures yourself. Let the glow of finishing that first draft wear away before you read it. It’s also useful to log several years reading and critiquing other writers manuscripts. We can easily see flaws in other people’s work that hide from us in our own work. It’s not because we’re better writers, it’s because we’re too close to the material. Objective distance is critical to gauging your own abilities. 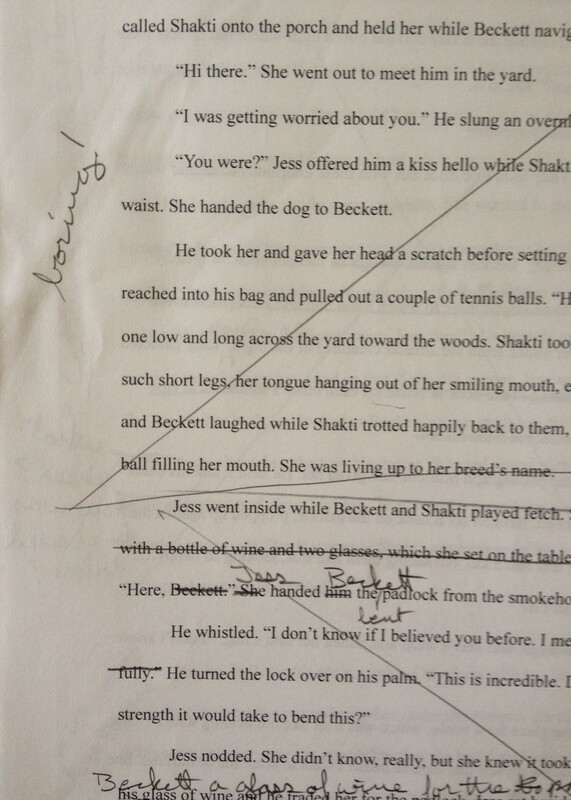 Even experienced writers need peers and editors to read their work. And always, always give it time. Just as I was beginning the revision of The Murder in Skoghall, I was called away by a teaching job that I couldn’t turn down. It forced me to rest the manuscript for six more weeks. I’m sure I would have realized the climax wasn’t cutting it before going to print…right? I don’t know for sure, because the way it happened I did have those extra six weeks. Now I’m ready to sit at the keyboard and type in the minutiae of editorial changes–this word, that comma, yawn. But I’m looking forward to getting to the end of the book and rewriting the climax. Then I’ll take a break and read it again. Re-Vision isn’t just about seeing something again; it’s about seeing something again as for the first time.